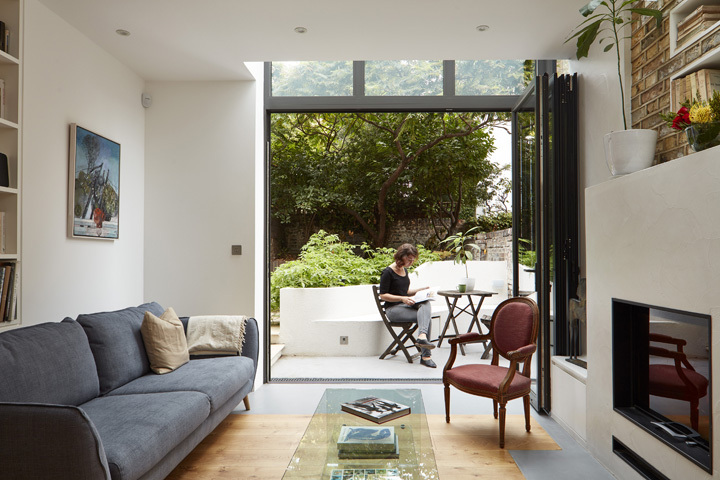 The architects’ clients approached them soon after purchasing the house in order to design a rear extension and re-design the lower ground and ground storeys. The main issue which was the owner found disturbing was the house’s narrow floor plan, only 4.4M wide . The lower ground floor had to house a new kitchen, sitting area and dining area without feeling like a long and narrow sequence. The size of the house called for the utilisation of every little corner of the lower ground floor. 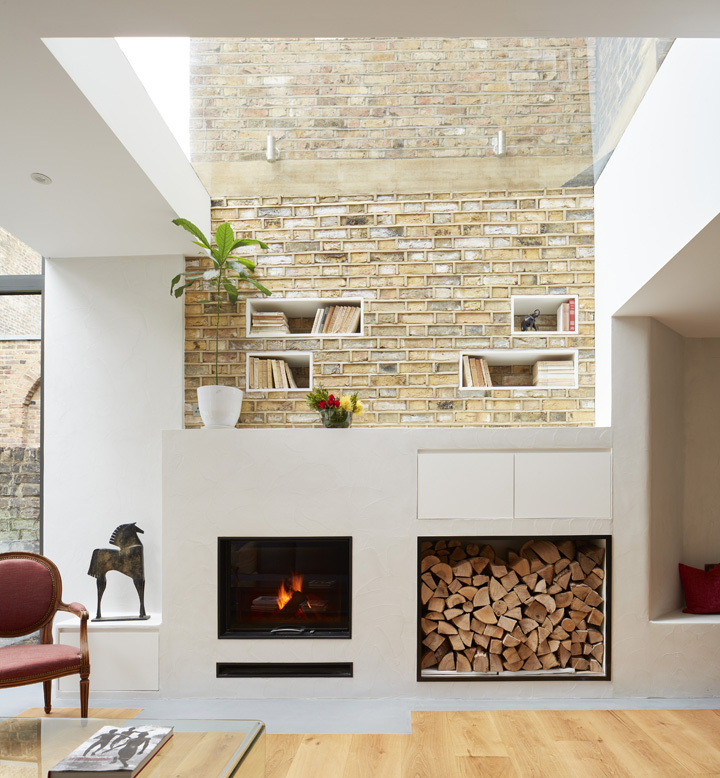 Space under the stairs is maximized, built-in furniture against the walls and a large glazed part of the roof, all contributes to a sense of width and allows light to penetrate all the way into the interior. 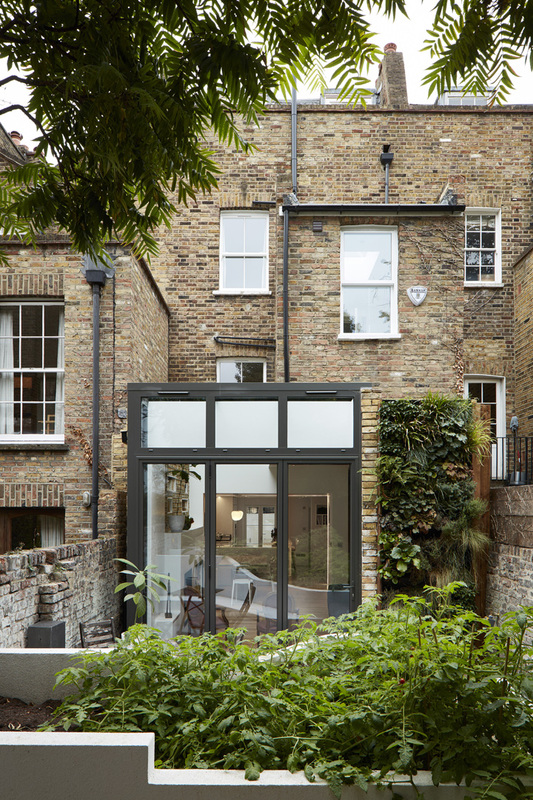 The exterior design is of modest proportions and respects the conservation area and the continuity of the rear facades of the terrace. Square shot of sitting room with french windows open and figure reading outside. Private Home Islington, London, United Kingdom. Architect: Scenario Architecture , 2016. Square shot of fireplace. Private Home Islington, London, United Kingdom. Architect: Scenario Architecture , 2016. Square shot of exterior rear elevation. Private Home Islington, London, United Kingdom. Architect: Scenario Architecture , 2016. Figure cooking in kitchen. Private Home Islington, London, United Kingdom. Architect: Scenario Architecture , 2016.